Using telescopes to watch the distant Kuiper Belt object Ultima Thule pass in front of star on Aug. 3-4, observing teams in Senegal and Colombia report that they've gathered data on New Horizons' next flyby target. Observing the object is a crucial step, but only the first. The team has weeks of data analysis ahead. "We have lots of work to do," said Marc Buie, the New Horizons co-investigator from Southwest Research Institute who leads the observation campaign. "We all fought weather issues [in Senegal and Colombia] but prevailed anyway. The observing teams are due a huge amount of thanks for their efforts." The New Horizons team is using stellar occultation observations to gather information about the size, shape, environment and other conditions around Ultima Thule. These data are critical to planning the mission's flyby of the object on Jan. 1, 2019. Read here about the preparations for the observation campaign. 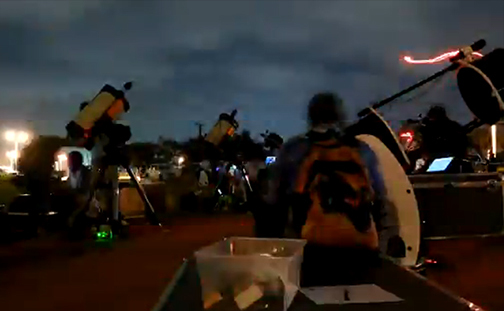 Watch this timelapse video of observation rehearsals from New Horizons team member Simon Porter. Gathering occultation data is a difficult task. Read here about the successful campaign to gather initial data on Ultima in 2017.